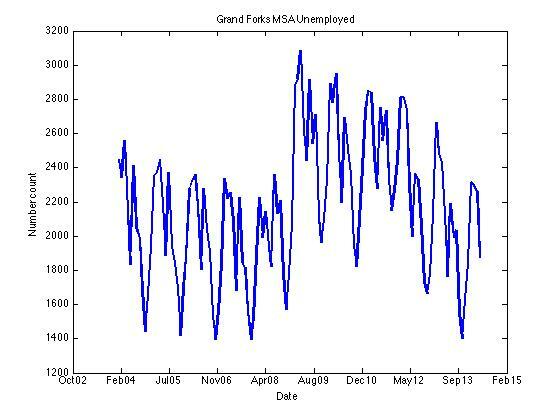 Employment in the Grand Forks MSA is declining and has been for some time as far as the trend shows. Declining employment should be a concern on its own. While there are perfectly logical and innocuous reasons possible they are less likely when coupled with what is happening in terms of unemployment. As we see, unemployment is also on the decline in Grand Forks. So employment is going down at the same time unemployment is declining. So the loss of employed is not translating into more people unemployed. 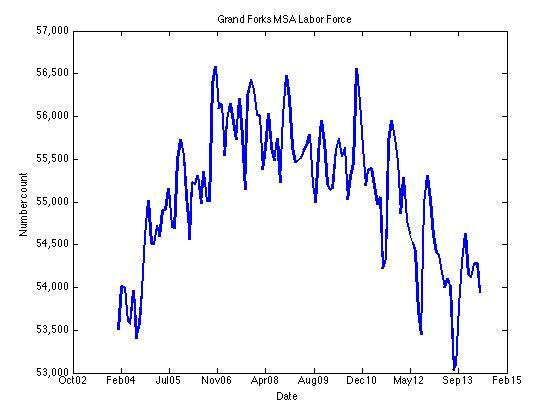 Of course, this implies that the labor force in the Grand Forks MSA is declining as well since labor force is the sum of the employed and unemployed. 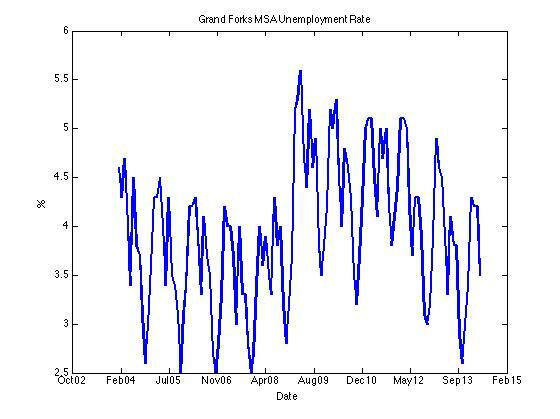 These are negative trends for the labor market in Grand Forks. I am sure many employers have stories that explain some of the trends behind these graphs. As I mentioned in other posts and on the radio, the higher wages in the oil patch are creating spill overs (probably not the best term but it works) throughout labor markets across the state. To attract new workers, or simple retain the existing ones, employers from all over the state need to respond to the higher wages paid to workers in places such as Minot or Williston. In more general terms, labor is probably the most significant constraint Grand Forks will face in the short- and medium-term future. Some further investigation is necessary to speak to more detailed issues such as skilled v. unskilled labor, but the fact remains that company growth plans will likely need to take note of these trends and make adjustments to growth plans if labor resources are not available. Of course these trends also have implications for the influx of new employers into a community. If labor resources are not available, or are too expensive, then a community is a less desirable target for location of new businesses. While amenities or education of the workforce could be attractive factors, it will be up to individual firms to decide if those “benefits” outweigh the “costs” or labor expense. Before I am accused of being too negative in my outlook I would point out that this does not mean Grand Forks cannot grow. Capital-labor ratios should be improving which should, over a period of time, increase labor productivity. In addition, a new equilibrium should be reached, eventually. 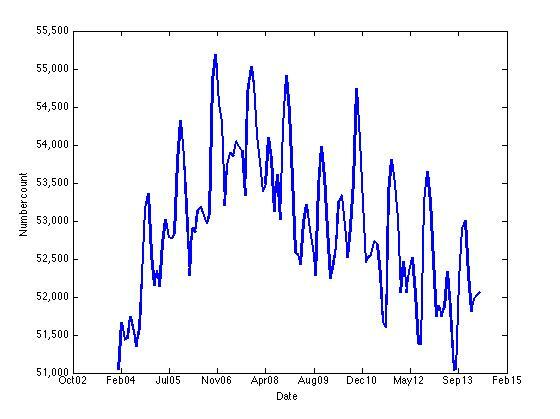 However, the oil patch labor shocks are best thought of as a repeated series of shocks, so that there is a constant adjustment process required. It can take a significant amount of time to reach equilibrium in such a circumstance. However, from a larger strategic perspective this should change the thinking as far as growth prospects and policies in Grand Forks. The shock to the state economy provided by oil created a change in the economic pecking order and in the geographic lead-lag dynamics. In particular, Grand Forks is not really a growth leader anymore, and the city and business here should look to respond to the activities in the west, both those of private firms and those of government. This could take the form of entering the supply chain for the oil industry, or the creation of entirely different industries in the area. The only thing that is completely clear is that status quo thinking will not serve the Grand Forks MSA well. It’s nice to see BLS State & Area statistics used in an analysis, instead of just being a blurb in the news. You must remember that you are way out in the tail of ability to interpret and assess economic information. Most people take a simplified linear cause and effect approach, which in many cases works just fine. However, as soon as complicated dynamics start to get involved that process likely takes you in the wrong direction.